true story, I Don't think she dies just yet if at all. I don't think Beric's gunna get it either, unless he does something spectacular first. Sandor had a line in the last episode reminding us how many times he's been resurrected. Had to be for good reason. 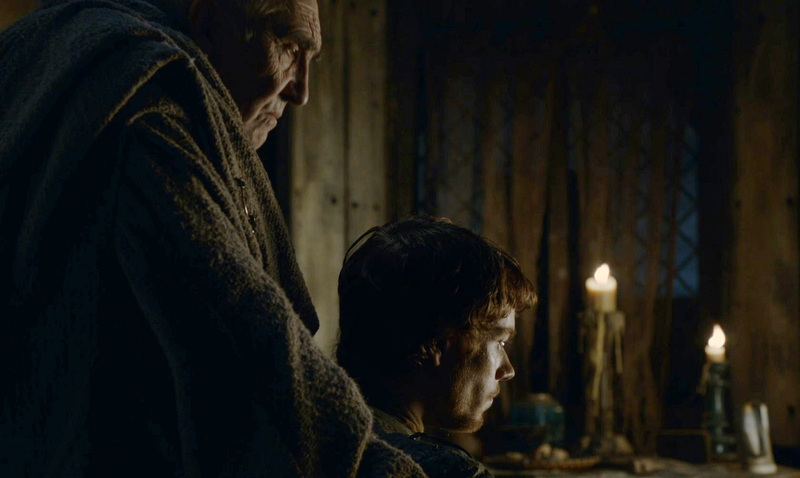 Considering what we've seen, and what the likes of Bran, Jon and Edd are supposed to know, I think that it's insanely stupid to put people down in the crypts beneath Winterfell --where the Starks have been storing their dead for centuries! How many corpses are down there awaiting reanimation, I wonder? Jon and Edd witnessed this! I'm sure a lot of the corpses down there are just bones, but in our world, some ancient corpses have held together fairly well in Egypt and South America when they were interred in cool, dry, dark places and not directly in the dirt. Ancient sarcophagi are typically stone lids simply placed atop coffins, their weight holding them in place, and in the cases where some primitive cement was used to "seal" them, such quickly became crumbly and retained no adhesive integrity at all. As we've seen, many of the wights are also just skeletons, and they possess considerable strength! The one wight which was transported to King's Landing had to be secured in a box locked with steel chains! So if the wights were strong enough to literally burst out of the frozen ground as they did in the scene above, then they can also push coffin lids off! But I also suspect that the way out may be down there as well. Back in Season 2, when Theon and the Ironborn were besieged at Winterfell by Ramsay and the Boltons, Maester Luwin told Theon that there are secret ways out of Winterfell and I think these are about to become necessary! THEON: "I won't make it to the Wall. I won't make it 10 feet past the Winterfell gates." MAESTER LUWIN: "There are ways. Hidden passageways built so the Lords of Winterfell could escape." No he doesn't want the IronThrone, he wants to create another AotD in south so even if Bran escapes the North, here they come from the south. Well brother your theory that the Night King goes to King's Landing (and/or Oldtown too) is gaining some traction. I had quite forgotten about Bran's visions in Season 4 which included one of a ruined, snowy throne room (which Dany also saw in the House of the Undying in Season 2) and the shadow of a dragon over King's Landing, both things which haven't yet come to pass. I initially thought that the throne room vision might have been purely symbolic. Last edited by L.M. ; Yesterday at 09:06 PM.